Following the EU's suit, a number of Latin America and Asian countries will automatically grant visa-free travel to Ukrainians, he said. Having received a visa waiver from the EU, Ukraine finally departs from Russia and returns home to Europe, President Petro Poroshenko said. 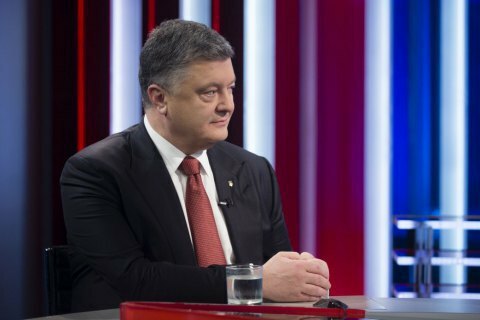 "I would say that today Ukraine has finally drawn up divorce from the Russian Empire and that's how we should perceive it in philosophical terms," the president said in an interview with One Plus One TV late on 11 May. He stressed that the EU decision contributed to the freedom of movement of goods, capital and people. "It's not just about visa-free border crossing, but about Ukraine returning to its historical place among European countries," the president said. He noted that there were obstacles inside and outside the country and even some Euro-optimists have publicly appealed to the leadership of the European Commission and the European Union asking not to give visa waiver to Ukraine. According to Poroshenko, there were external obstacles, in particular, the attempts to mobilize anti-European forces within the EU with a view to preventing granting visa-free travel to Ukrainians. He also said that after the EU abolishes short-term visas for Ukrainian citizens, a number of Latin American and Asian countries will also follow suit. "Another good news is that over 35 countries in Latin America and Asia, which have visa-free travel agreements with the EU, will automatically grant Ukrainians the right to travel to Latin America and Asia," he said. Poroshenko recalled that Ukrainians would also have the right to travel without visas to Norway, Switzerland and Liechtenstein. Earlier that day, the Council of the European Union approved the final decision on visa liberalisation for Ukraine. It is expected that Ukrainians will be able to travel to the EU without visas starting with 11 June. President Petro Poroshenko described the visa-free regime as "a giant step towards Europe". The EU Delegation in Ukraine posted a video in which the EU ambassador congratulated Ukrainians on visa-free travel in Ukrainian.